With more than 3,000 frog species in the world, it's no surprise that frogs come in various shapes, sizes and colors. Frogs live on every continent in the world, except for Antarctica. They can be found in just about every type of habitat from ponds to trees to gardens. Most frogs are solid colors, but some are dotted with two shades. Five main types of frogs have spots on their sides. Ornate chorus frogs are aptly named for their colorful bodies and unique mating song. They range in size from 1 to 1 1/2 inches and have small, round toe tips. The bodies of ornate chorus frogs are primarily gray, green or reddish-brown with a black stripe across the eye. They also have dark brown to black spots on their sides and groin area. Some species have yellow spots instead of brown. When the frogs call for females, the sound resembles a sharp, metallic "tink," often repeated in succession. The pickerel frog is a medium-sized frog recognized by the rectangular-shaped spots that decorate its sides and back. 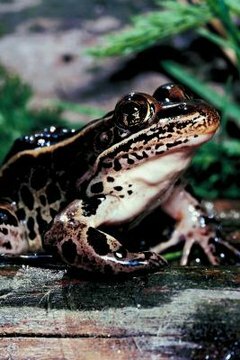 The amphibian is generally a light tan or gray color with dark brown spots. The pickerel frog also typically has a bright yellow or orange coloration on its inner hind legs and belly. The northern populations of the pickerel frog are more of a whitish color, while the coastal plain populations are mottled with dark splotches. Adult frogs range in size from 1 to 2 inches. The frog's colors enable him to easily blend into the foliage of his surroundings and camouflage himself. The frog's home is usually a bog or meadow streams. The largest of the North American frogs, the American bullfrog can grow up to 8 inches in length and weigh more than a pound. His reptilian coat is generally green or gray-brown with brown spots covering his sides. Bullfrogs are known for their deep baritone calls that resemble the sound of cows. Because of their large size, a bullfrog can ambush and eat nearly any small critter that fits into his mouth. Insects, mice, birds and snakes are some of his favorite snacks. Barking tree frogs derive their name because from a distance, they tend to sound like a group of barking dogs. They are medium-sized frogs, averaging just more than 2 inches in length. Barking tree frogs are usually bright green with dark, round spots on their sides and back. They are heavier-bodied and have more granular skin than other tree frogs. Barking tree frogs typically spend the majority of the year high in trees, but require wetlands to breed. Often confused with the pickerel frog, the northern leopard frog is one of the most frequently used frogs to dissect in high school biology classes. The frog is one of the most abundant frog species in North America and is widely used for food in the restaurant industry. The amphibians are named for the array of irregularly shaped spots on their sides and legs. They are generally greenish-brown in color with a pearly white underside. The frogs range in size from 3 to 5 inches with females being larger than males. Western Connecticut State University: Who is the Pickerel Frog?